Andrew Carnegie was born in Dunfermline, Scotland, in 1835. His father was a weaver who was slowly pushed out of business by the steam-powered looms of the Industrial Revolution. On his mother's side of the family, the Morrisons, Andrew had a radical grandfather and uncle, who favored such reforms as abolishing the monarchy and allowing all men to vote. The Morrisons especially disliked the local aristocrats, the Hunt family, who had begun enclosing pastureland previously available for everyone's livestock. The enmity was mutual, and on the one day a year that the Hunts allowed the local plebs into their Pittencrieff estate to see its medieval ruins and beautiful gardens, Andrew and his little brother Tom couldn't go. Morrisons and their kin weren't welcome. Decades later, Andrew Carnegie ranked among the richest men in the world and, to complete the poetic justice, the Hunts had mismanaged their finances so badly, they needed a buyer for their estate. Carnegie bought it. The new "Laird of Pittencrieff," as he gleefully called himself, didn't keep the property for his own use. By then, he had his own Scottish castle at Skibo. Instead, he turned the Hunt family's former home into the public Pittencrieff Park. 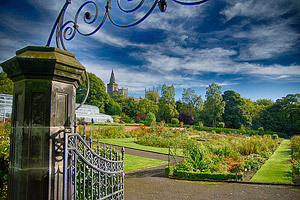 It was a gift to Dunfermline, and would be open to visitors all year. After amassing one of the greatest fortunes in history, Carnegie set about giving most of it away, and he did the same sort of thing with fossils that he did with gardens. You might even argue that more people saw dinosaur skeletons because of Andrew Carnegie than because of any other single person. Carnegie didn't make his fortune in Scotland. Growing closer and closer to starvation, the Carnegie family moved to Pittsburgh when Andrew was 12. His father didn't do much better finding steady work in America than he had in Scotland, but his mother took in laundry and mended shoes to earn a little money. Andrew went to work right away, working first in a textile mill, then delivering telegrams. On Saturdays, he educated himself by taking advantage of a private library that opened its doors to local boys. Inside and outside of work, he was smart and industrious, and he advanced quickly. Between railroads and steel mills, Carnegie became fabulously wealthy in the late 19th century. He and his mother eventually settled in a brownstone in New York, and after she died, he married Louise Whitfield (about 20 years his junior) and spent about half of his time in Scotland. Just as he divided his time between the Old World and the New, Carnegie divided his philosophy between the Social Darwinism espoused by Herbert Spencer, and a commitment to advancing the greater good of society, even the underclass. He apparently found these different outlooks entirely compatible. 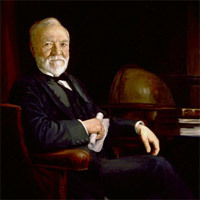 Carnegie applied Spencer's "survival of the fittest" mantra to his business practices, and he could be ruthless in the pursuit to dominate the steel industry. In Carnegie's view, the winners were the ones who deserved to win. Like him, for instance. Carnegie admired Spencer enough to invite him to Pittsburgh, believing the city to be an industrial utopia of Social Darwinist ideas. Spencer accepted the invitation, but reputedly found Pittsburgh's late-19th-century smog so awful it would "justify suicide," and said as much to Carnegie's face. Besides the desirability of Pittsburgh, Carnegie and Spencer differed on other issues. Spencer apparently favored unadulterated capitalism, but in practice, Carnegie favored tariffs and monopolies (namely his own). Given his own pedestrian background, he was understandably less entranced by eugenics, thinking capable people could come from all classes. And Carnegie believed that wealthy men had an obligation to the less wealthy. Carnegie had a complicated mix of aspirations. In his steel empire, he invested the profits in innovations that made steel less expensive, but he apparently felt that part of the equation of keeping steel inexpensive was keeping wages low. Ten thousand "Carnegie Public Libraries" would not compensate the country for the direct and indirect evils resulting from the Homestead lockout. Say what you will of Frick, he is a brave man. Say what you will of Carnegie, he is a coward. And gods and men hate cowards. In fairness to Carnegie, few of his industrial peers even entertained the notion that workers might have any rights. Whether or not he believed what the St. Louis Post-Dispatch said about his character, he apparently disbelieved what the paper implied about libraries, music halls and museums. In 1895, he opened the Carnegie Institute in Pittsburgh. The institute's suite of scientific and cultural venues included a natural history museum. Initial offerings at the museum included an Irish elk and a mammoth, but Carnegie wanted more. He publicly hinted that he hoped O.C. Marsh would send Pittsburgh some dinosaurs from Yale, or go dig up something new, but Marsh got out of that obligation by dying. Exploring more than one avenue to his dinosaur, Carnegie saw a spread in the New York Journal and Advertiser about "How the Brontosaurus giganteus Would Look If it Were Alive and Should Try to Peep into the Eleventh Story of the New York Life Building." The hyperbolic description of the dinosaur boasted that its stomach could hold three elephants, and its roar could be heard 10 miles away. Carnegie initially hoped to buy the newly discovered dinosaur, but he soon got a better idea; he assembled his own team of fossil diggers who departed for the Wyoming badlands and eventually returned with a Diplodocus skeleton. Diplodocus fossils had been found before, but the paleontologist John Bell Hatcher studied this new fossil closely enough to find — perhaps conveniently — sufficient differences from earlier skeletons to name a new species in the genus: Diplodocus carnegii. 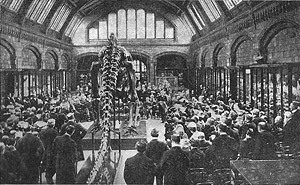 Hatcher's rendition of the dinosaur skeleton was hanging in Carnegie's study at Skibo when King Edward VII visited in 1902. The King wanted a dinosaur for the natural history museum in London just as badly as Carnegie had wanted a dinosaur for his museum in Pittsburgh. Eager to please the King, Carnegie dispatched orders to his people back in the states to go fetch another dinosaur fossil. That assignment wasn't as easy as Carnegie imagined, so the parties reached a compromise: Pittsburgh would send London a plaster cast of the fossil. If you've looked at many fossil skeletons in natural history museums, you may have noticed that the skeletons are often partly or entirely comprised of casts. You may have heard other visitors lament that those casts are fakes. (You may have even said so yourself.) Casts have occasionally been used for deceptive purposes (the nutty fossil hunter Thomas Hawkins was an especially egregious offender) but thinking of them all as fakes is not fair to casts. With few exceptions, fossil bones that are tens of millions to hundreds of millions of years old — and that includes dinosaur bones — are petrifactions. In other words, they are bones turned to stone. And stony fossils often combine two qualities that are bad by themselves and awful together. They are heavy and fragile. Plaster-of-Paris casts are based on the original fossil bones and, if they have been skillfully made, are exact replicas, just lighter and less breakable. Their lighter weight makes them easier to mount in lifelike positions, and Diplodocus carnegii demonstrated that fact. Nicknamed Dippy, the cast of the fossil went on display in the Natural History Museum in London in 1905 — two years before the original fossil went on display at the Carnegie Museum of Natural History in Pittsburgh. Part of the reason the Pittsburgh paleontologists needed more time was to find a way to support the heavy petrified bones. Casts provide another benefit besides their light weight. They are also easier to replace if they are damaged or destroyed because multiple casts can be made from a single fossil. And that was exactly what happened with Diplodocus carnegii. London got the first Dippy cast, but it didn't get the last. Carnegie's team sent fossil casts to natural history museums in Berlin, Bologna, St. Petersburg, Vienna and Paris. (In Paris, the president of the French Republic attended the dinosaur's unveiling and, lousy public speaker that he was, managed only to exclaim, "What a tail! What a tail!" to the dismay of French scientists, but to the delight of French songwriters looking to pen something risqué.) The team even sent a cast to the museum in La Plata, Argentina, which went on display in 1912. So in the case of Diplodocus, casts meant that the people who got to see what a dinosaur skeleton looked like numbered not in the thousands but in the millions. Plaster of Paris deserves a little respect. Dippy remained a fixture of the Natural History Museum in London for over a century. When the museum announced, in January 2015, that Dippy would be relocated elsewhere to make room for a blue whale, the decision prompted a public outcry, a Twitter hashtag, and multiple petitions to keep the cast in place. Despite the pleas, the blue whale took over the coveted spot in London as Dippy commenced a tour of the United Kingdom, allowing plenty of UK residents see Dippy pass through their hometowns. Carnegie died in 1919 but his libraries and museums live on. The Carnegie Museum of Natural History has continued collecting and displaying dinosaur fossils, including Apatosaurus, Triceratops, Stegosaurus and Allosaurus. Natural history museums and universities the world over continue to make each other copies of fossils today, ever enlarging the number of people who get to see prehistoric life.